This comic exists in two storytelling modes, with a flashback fleshing out Natasha’s relationship with the Weeping Lion, and Natasha aggressively moving on The Dark Room. Both are well crafted and the balance struck between the two works well for this issue. Initially, I’ll be honest, I didn’t see the purpose of the flashback but Samnee and Waid brought it all together very well as the issue progressed and the fact that every aspect and minute story detail always comes back to something big in this comic is part of why I love it. This issue is an expertly crafted tale, with a ton of information packed into the issue that simultaneously introduces the arc to new readers and builds on what has come before. Don’t think this is a talking heads issue though, Natasha brings the hammer down at points and there are some shocking story beats that bring a lot of weight to this comic. Samnee and Waid are doing a great job peeling off the layers of Natasha’s past and how complex her life is while also building up current threats that are hers (and hers alone) to deal with. This is a comic as layered as Natasha’s life as a spy. And boy, oh boy, can this Samnee cat make the art good. He and all-star colourist Matt Wilson are a team that is in such a groove that all we can do as readers is sit back and enjoy the glory. Black Widow is one of the most complex characters in comics and Samnee and Wilson make sure that the visuals reflect that, using shadows, amazing panel layouts and unique camera angles, for lack of a better term, to keep this story engaging and dynamic. 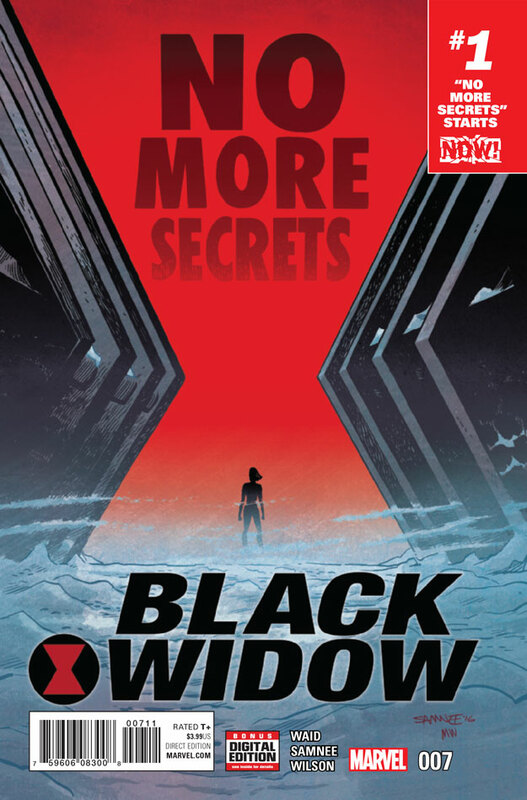 Black Widow #7 is a great start to what looks to be a very interesting arc. Samnee, Waid and Wilson do not miss a beat in this one and it will easily be one of your best reads this week. Sign me up for more “No More Secrets” cause this is one of the best damn comics around.